It’s completely out of the frame of debate that we are living in a beauty obsessed world. I think beauty is the next big thing people really care about after their lives. The generation believes in spreading beauty in and out everywhere and I think that holds a substantial degree of truth in it. We beautify and decorate our surroundings and ourselves on special and festive occasions. This is done to generate good and positive vibes around so that we can feel better and make our soul happy. If we are beautiful and attractive, we feel awesome and more confident and hence contribute more to a happy society. Nose is a very vital contributor to beauty aesthetics, right? But, unfortunately not all of us are blessed and god gifted with a sharp and beautiful nose. Though beauty is completely free from restrictions of formulas, however, We at Aestiva Plastic Surgery Clinic believe the 4S formula can elaborate the beauty threads of nose up to some extent. By 4S we mean sharp, small, straight and symmetrical nose which lends massively to the beauty quotient of an individual. WHAT RHINOPLASTY CAN DO TO YOUR NOSE? 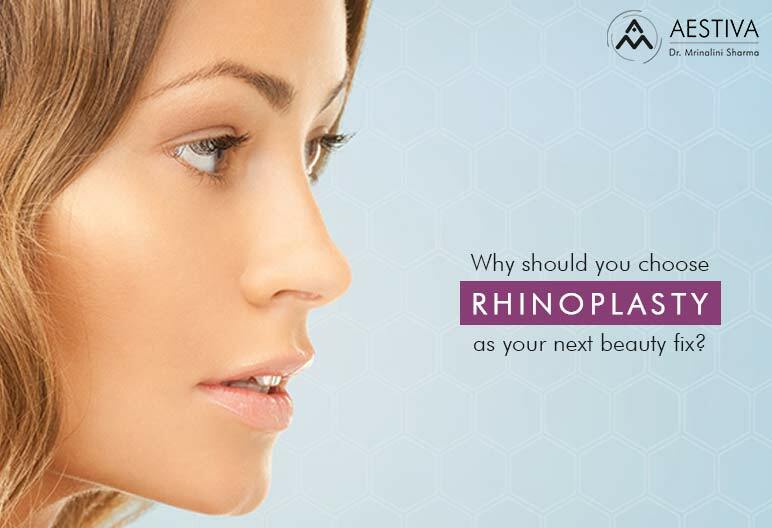 Rhinoplasty is acquiring the rage and popularity globally. It is a cosmetic surgical procedure done in order to correct the defects of your nose or do an overall enhancement of your nose. So, if you have a nose with crooked tip or malignancy in dorsum which is also sometimes referred to as dorsal hump, rhinoplasty is the treatment for you. In fact, it can work wonderfully to bring nice and natural changes to tip, nostrils, and bridge of the nose. In other words, we can say that it does the much-desired reshaping of the nose to highlight the features of a face. I would like to quote that it’s not only a women-centric treatment but men are also largely going for this surgery. This is because gone are those days when beauty used to be synonymous with women only. Men are equally privileged to look good and take efforts for same. 1) Corrective Rhinoplasty: This type of procedure targets the existing problems of a nose and its shape. It claims to fix the issues of a crooked tip or deviated nose, which is largely known as the dorsal hump. 2) Cosmetic Enhancement: This procedure aims to provide massive cosmetic enhancements to your nose. It includes working for a more sharper tip or stronger nasal dorsum. Thus, anyone who is even not facing any malignancies in the nose shape or structure, but wants a more defined and corrective look of their nose should go for this procedure. This is a short procedure however it may take 7-10 days for healing and making you capable to return to work. Minor swelling is found initially but subsides gradually. Rhinoplasty has the caliber to transform you into a completely new man or woman for sure. This is for the reason that if you own a lovely and sharp nose, it can overshadow some of your weak facial features. Thanks to medical and scientific advancements, Rhinoplasty is a completely safe procedure if done by a professional and skilled cosmetic surgeon. If you have any further doubts or queries please feel free to write to us at- info@aestivaclinic.com.